The benefits of a line array are high sensitivity, wide horizontal dispersion, and a high degree of vertical pattern control. Can you get those benefits from a line array that doesn't run from the floor to the ceiling? The answer is yes. The SLA, Short Line Array, takes the line source concept to the small end of the scale. Well, I'm finally done building my pair of SLAs. They look awesome! Had my audiophile buddy give them a listen they other day and thought they sounded GREAT, smooth through all the frequencies. Great plans, fun build! Over the summer I'll build an auto tuba to go along with them. The standard SLA may be built with four 4" midbasses in a 19 inch high cabinet, or with six 4" midbasses in a 28 inch high cabinet. If space is at a premium build it 15.5 inches high, loaded with four 3" drivers. Also included is a two driver surround speaker version. If your room won't allow for a vertical home theater center the CurveArray version gives the widest possible dispersion from a horizontal multi-driver cabinet. The CurveArray may be built with six 4" midbasses in a 31 inch wide cabinet, or nine 4" midbasses in a 46 inch wide cabinet that will meet the center channel output needs of any home theater. At the opposite end of the size range it can be built with four 3" drivers at 16.5 inches wide by 6.5 inches high. All seven versions are contained in the SLA plans. Suggested subwoofers: Tuba 18, Auto Tuba, Table Tuba, Tuba HT. Equivalent Retail Value: $599 for the four 4" driver version. Plans are $14.95, delivered within 24 hours as email attachment in MS Word format. 18 pages, with over forty construction diagrams. PDF version available on request. The plans are absolutely complete, showing detailed pictures of every construction step. Included are lists of parts, recommended drivers, and T/S driver spec requirements for driver substitution. Also included is a detailed 3D model, showing cutaway views of every version and every part, right down to the wiring. The SLA Pro is the smallest line array format PA cab available, delivering high output with extreme clarity in a compact package. The standard six inch woofer version may be built with two Eminence Alpha 6 in a 15 inch high cab, or four Alpha 6 in a 29 inch high cab. The micro four and five inch woofer versions may be built with two Eminence Pro 5W in a 13 inch high cab, or four Alpha 4 or Pro 5W in a 25 inch high cab. It's the right size for smaller gigs, like weddings and corporate events, or for DJ monitoring. For larger gigs they can be stacked, in both straight and spiral array configurations, for either maximum throw or maximum horizontal dispersion. 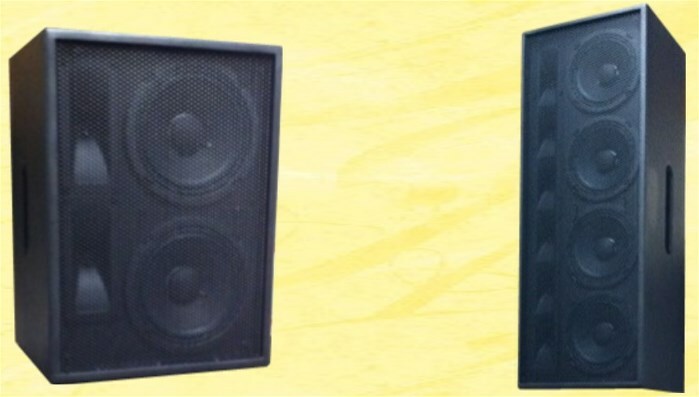 For Line array speakers dominate the world of pro-touring sound, because they work better. SLA Pro puts the advantages of line arrays within the reach of every band and DJ. Suggested subwoofers: Tuba 24, 30 and 45, Titan 39. Equivalent Retail Value: Two midbass version $449, four midbass version $899. Plans are $14.95, delivered within 24 hours as email attachment in MS Word format. 17 pages, with over 40 construction diagrams. PDF version available on request. The plans are absolutely complete, showing detailed pictures of every construction step. Included are lists of parts, recommended drivers, and T/S driver spec requirements for driver substitution. The SLA and SLA PRO are two separate plans. If you want the SLA PRO you must specify SLA PRO on your order, otherwise you will be sent the standard SLA.